Samyang has plans to announce 8 new lenses by the end of Q2 in 2019. 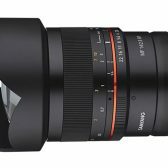 The first lens they announced was the 10mm f/3.5 for the EF mount yesterday. It now that Samyang will launch two new manual focus lenses for Canon’s RF mount very soon. 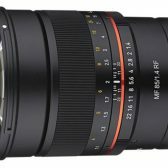 The two lenses coming will be a 14mm f/2.8 RF and an 85mm f/1.4 RF, as mentioned earlier, these are both manual focus lenses. We’re not sure if these are simply mount conversions of existing lenses or new optical designs. Well I was planning on getting the EF 14mm version, but I’ll wait and see how these come out. The OP photos of the lenses appear to have built in extensions to account for the RF flange distance difference from EF. So probably the same old optical formula with a new mount and MF. Most likely. A quick, inexpensive way for Samyang to get into the RF mount. And 2 reasonably good spots to hit, the 14 and 85. I really like the wide angle options we may have for the RF mount by the end of the year. Strange then that they are using the older manual focus optical design and not their newer AF one. They probably don't have the technology to do AF on the RF mount yet. They're barely getting into AF on the EF mount. Just a thought - as noted earlier, they seem to have taken the EF lens and put a different mount on it. The 14 mm in particular would benefit greatly from the shorter flange distance, which would require much less retrofocus in the design. These are definitely mount converted lenses. I got them for testing. Probably better value to get the EF version and a generic EF-RF non-autofocus adaptor if you don't already have any EF-RF adaptors. And far more practical if you also still have EF bodies. 24mm TS-e ii is life! For the 14mm I think you'd be better off with the EF mount version, then you can use the drop in filter adapter. This actually goes for most Lenses that don't easily take standard filters. They released AF version for EF and go back to MF for RF. Big thumbs down for both lenses. Has someone checked if the EF version AFes on RF with Canon's adapter? so samyang made manual, then moved to Af and now ith the ef they're going back to Manual? A few steps back isn't it for them? Prob best just to splash out and get a proper AF lens. For the 85mm it is a big issue. Incidentally, I wonder if the APS-C version of this lens registers as a FF lens on the RP? Third-party lenses may let you get away with using a crop lens in 4K which is otherwise disabled on that camera. The 14 mm in particular would benefit greatly from the shorter flange distance, which would require much less retrofocus in the design. Any third party lenses for Canon will have reverse engineered autofocus. I doubt Samyang has worked out the R mount autofocus yet and reverse engineering will never beat native autofocus for reliability. Also, don’t expect Zeiss to produce R mount autofocus lenses. Sony share their autofocus technology which is why that mount has autofocus lenses from Zeiss.